Our air-operated sealer is ideal for medical and lab applications that require validation or for setting production parameters pre-scaleup. The robot jaw closes for a preset period at a controlled temperature when the foot switch is depressed, resulting in a high-quality, uniform seal. Available in two models. The robot jaw offers you the kind of precise, repeatable sealing required by the FDA and other regulatory bodies. 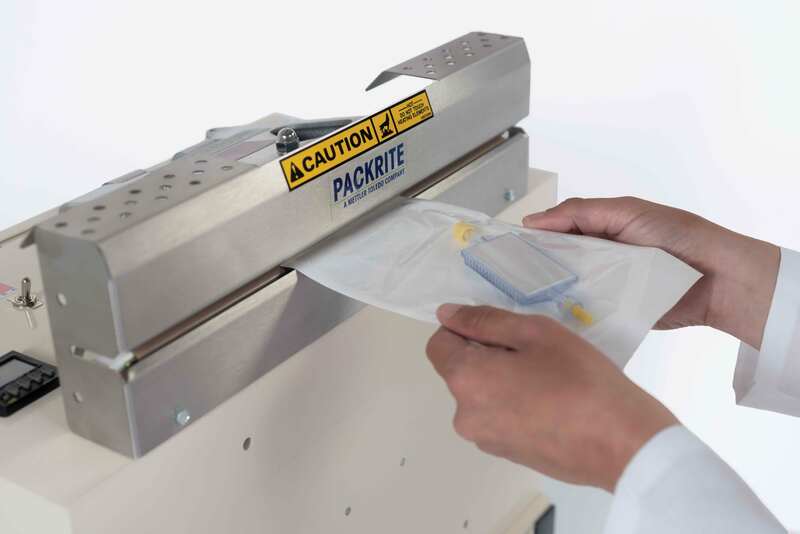 Model RTP, developed for lab use and ideal for medical applications, seals medical pouches, polyethylene foils, and dust covers. Model R is ideal for MIL-SPEC materials, Mylar™, foils, cellophane, krafts and polypropylene, and supports validation requirements. The unit easily adapts to your application needs with three mounting options: flat (standard, standing operation), incline (away from operator, seated position), and full vertical (ideal for sealing liquids or powders). Air can be supplied via 30-100 lb. of compressed air in-plant or via a minimum 2.5 cubic feet/minute compressor. Robot heat and pressure settings are tightly controlled for excellent seal integrity. Digital dwell control timer and a calibrated digital temperature controller regulate temperature settings of up to 600 °F with an accuracy of ±0.25 percent of full scale, while sealing-bar pressure is controlled via an adjustable air valve on the machine.